In this game you must launch your best guys and get so many points. They will roll from the really huge mountain and have so much fun here. Would you like to do it with them? Then just do not waste your time and set the best record. Do you like snow? Then help these two guys! 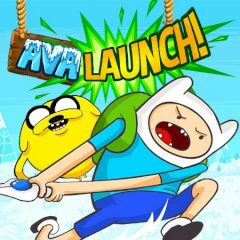 Well, in this game you are going to play with Finn and Jake, so just have faith in yourself and play this amazing game. Well, here you are going to control your best friends and help them to have so much fun, while rolling from the mountain. Are you ready for that? Then just use the mouse to play and set the best record. Everything depends on you, as longer your way, so much points you will get. So, enjoy the game and you will really love it. Enjoy the game and have fun.